As someone of Antiguan descent, and simply exhausted from trying to explain where the island is, I think it’s about time to point out how truly outstanding Antigua and Barbuda really are (and clarify their location!). Originally colonized by the English and the Dutch, and known for its 365 beaches, this rarely cloudy destination is often overlooked, but definitely not short on gorgeous looks. 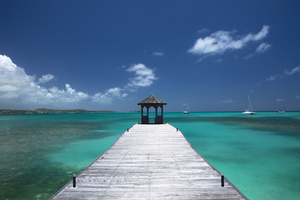 The island of Antigua is located North of Barbados, and east the Virgin Islands, while Barbuda is located just to the north of Antigua. For a romantic getaway, Jumby Bay is where you want to be. Sitting right off the shores of Winthorpes Bay, and accessible only by boat, it really is a small paradise in itself. 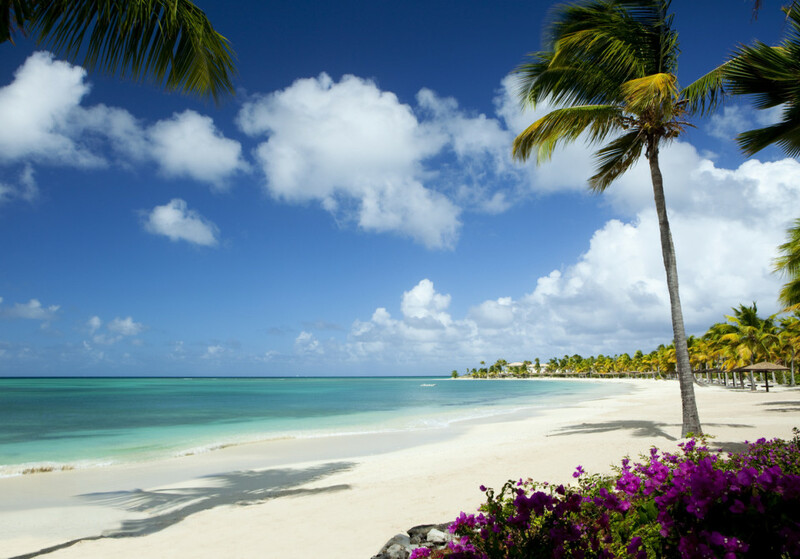 For family vacations, Blue Water Antigua is a lovely resort right on the beach, and kids stay free. 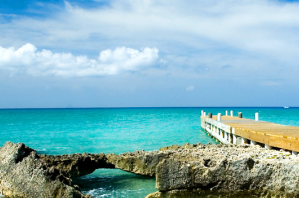 With plenty of fresh fish, spiced meats and Cajun flavors, Antigua and Barbuda is a great place to play with your taste buds. Hidden gems including Café Napoleon, located along Redcliffe Quay near Green Bay, and Hemingway Antigua along St. Mary’s street are both great places to find local eats. Southeast of Sri Lanka, you’ll find a combination of microscopic-sized islands so tiny you almost can’t see them on a map. This are the Maldives. Luckily, big things come in small packages, because wrapped around these tiny islands are the most gorgeous blue waters the eyes will ever see. If you are looking for luxury, there is no competition. 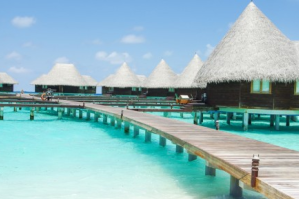 The Conrad Maldives Rangali Island, owned and operated by Hilton Hotels and Resorts, is located on the Island of Rangali, and famous for being the underwater hotel of the Maldives. Dine under, above or in the Indian Ocean at any of the thirteen in-house restaurants, or dip your toes in the water from your private villa while helping yourself to their outstanding room service menu. For the more budget-conscious traveler, The Somerset Hotel in Male is a popular choice for price, comfort and location. The beach is a short walk away giving you a great opportunity to explore the city while en route. When staying in Rangali, you must dine at the one-of-a-kind Ithaa Underwater Restaurant, housed at the Conrad Maldives Rangali Island hotel. Indulge in seafood Carpaccio and fresh fruit sorbets while surrounded by ocean life. For stay in Male, Sala Thai is a favorite spot among tourists and locals, serving up authentic Thai dishes. Just south of Italy, you’ll find Malta. Filled with castles and temples, and surrounded by the Mediterranean Sea, it is the ultimate destination for sun, history and exploration. 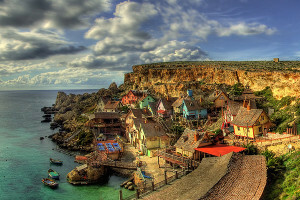 Mellieha is a large village at the Northwestern part of Malta, known for its gorgeous beaches and blue waters. Aim to stay close to Mellieha Bay if you’re looking to lounge for most of your trip, or if you’re specifically seeking adventure, stay at The Mellieha Bay Hotel, located along the beach with tons of activities to keep you entertained. The hotel’s restaurants offer local and international cuisine, with seating inside or outside along the water. Solana Hotel is located in the center of the village, and is a great spot for those who love a good day of walking and exploring. Check out Mellieha Fort just down the street from the hotel, or jump on a bus to just about anywhere in the village. The food in Malta is quite unique, featuring many Italian, Middle Eastern and African dishes. Although under Arab rule thousands of years ago, their spicy cuisine still predominates and is quite fantastic, especially when infused with popular European dishes. Many of these dishes can be found at Ta Randi, conveniently located just down the street from Solana Hotel. To stick to the Italian specialties, check out Rebekah’s Restaurant. With a menu filled with pastas, seafood and decadent desserts, plus the restaurant’s romantic atmosphere, it is the ultimate destination for an intimate date night. From volcanoes to rivers, rainforests to beach, San Jose is a great destination for the adventurous soul. Test out activities like hiking and white-water rafting, or just lounge and relax in the sun. Costa Rica is home to many eco-hotels and lodges, including Rio Magnolia, located about 30 minutes outside of the core of San Jose. The entire lodge is powered by their hydro-electrical system and all foods found in the restaurant are locally grown and produced — even the coffee is farmed onsite. While staying at the Rio Magnolia, you are welcome to get involved in some of their sustainability projects by volunteering for a few hours during your stay to help around the farm. If you are looking to stay downtown, Hotel Don Carlos is a cute boutique hotel in the older part of San Jose. Enjoy complimentary breakfast and book all types of tours at their activities desk. For a nice night out with your significant other, spice it up with Latin American flavors at Gastronómico El Punto, a favorite among locals. For family outings, try the fun and interactive Mirador Ram Luna, where you can be entertained not only by the native dishes but the traditional Costa Rican dance performances every Wednesday and Thursday nights. The restaurant also has a stunning view of the city. 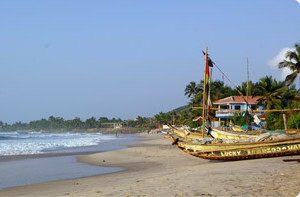 Just outside of downtown Accra, and up a dirt road, you will find Kokrobite (pronounced ko-crow-beet-eh), a small village with an incredible beach for swimming, tanning and water sports. Browse stalls along the sand selling jewelry, clothing and games, or head over to Big Milly’s for a drink while lying in the hammock. And when you are feeling adventurous, head into Accra for shopping and sightseeing. You actually only have two options when visiting Kokrobite. My favorite: Kokrobite Gardens. Stay in triangular huts or the camper beside the pool, and then grab breakfast, lunch and dinner at the Italian restaurant onsite. There are always daily specials, but their Bolognese pasta is outstanding, as well as their Italian coffee (a great bonus in the morning). The owners are a couple from Madrid who have traveled the world with their two small children. It is a very warm and welcoming place to stay. Big Milly’s is just a 2-minute walk from Kokrobite Gardens, located right on the beach, and offers everything from huts to full air-conditioned suites. Their bar is usually open until the last person turns in for bed, so it is definitely a great place to stay if you want to dance all night with locals and fellow tourists. Breakfast items at the restaurants are favorites like pancakes and omelets, and dinner items include fresh seafood, pasta and veggie dishes.